Faculty of Agricultural Product Innovation and Technology consists of three divisions and one research center: Food Science and Nutrition, Polymer Materials Technology, Biotechnology and Agricultural Products, and Agro-Industrial Research Center. All divisions are offered for a bachelor degree. Our Faculty was founded in 2009. 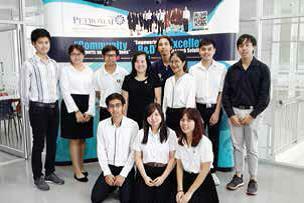 We now have approximately 560 undergraduate students studying in Ongkharak campus, Nakhon Nayok. Our aims are to prepare competent graduates who can apply knowledge of science and technology to local wisdom and natural resources in order to create innovations of agricultural products. Our Food Science and Nutrition encompasses not only scientific knowledge in food science and technology, this program also emphasis on how to create food innovation products. In Polymer Materials Technology program, we focus on biodegradable plastic synthesis and its applications, biomaterial productions, and utilization of both natural and synthetic polymer-derived monomers. In terms of Biotechnology and Agricultural Products (offered in Thai-English languages), we are distinguishable from the programs offered elsewhere. We mainly focus on fermentation technology, applications of molecular biology techniques to create innovation products for medical and cosmetic applications, and biomass conversion of agricultural products and waste into value-added products such as bio-based chemicals, food additives, and biofuels. In terms of academic activities, we strongly promote international related activities such as exchange student programs with well-known universities in Japan, China, Taiwan, and USA. We allow students to join other activities such as Visiting Scholar program and international conferences. In addition, our Faculty also provides social services on the research basis. Agro-Industrial Research Center provides academic extension services such as community services and sensory evaluation for food companies. These activities are not only meant to valorize the agricultural products and conserve natural resources and the environment in general, they are also intended to assure sustainable development of local communities, community enterprises, small scale industry, and other types of industry.